The proposal, sponsored by a GOP senator, goes down after the LDS Church's statement urging lawmakers not to upset a "delicate balance." 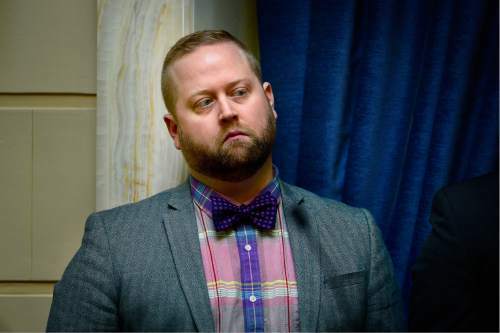 Scott Sommerdorf | The Salt Lake Tribune Assault victim Taylor Lamont, listens to debate on HB107 - Hate Crimes - on the Utah Senate floor, Wednesday, March 2, 2016. He was invited by Senator Urquhart to come watch the vote along with fellow victims Rusty Andrade and Maxwell Christen. The bill failed 11-17. 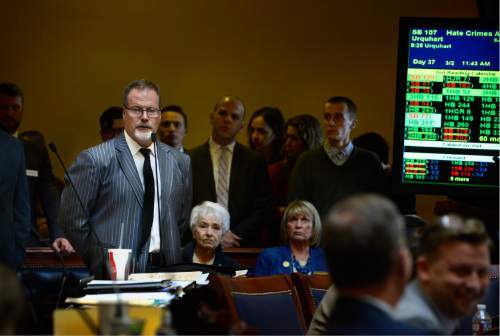 Scott Sommerdorf | The Salt Lake Tribune Sen. Stephen Urquhart, R-St. George, looks toward the gallery during voting Wednesday on his hate-crimes legislation, HB107. The bill was defeated on an 11-17 vote and appears to be dead for this legislative session. 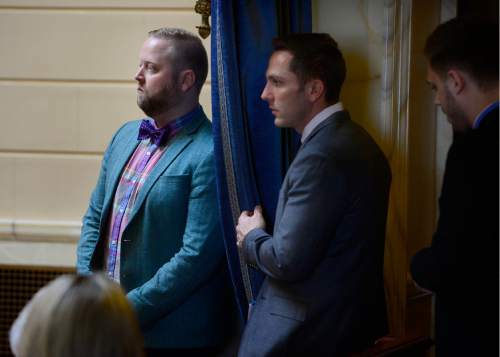 Scott Sommerdorf | The Salt Lake Tribune With assault victim Taylor Lamont at far left, and Equality Utah Executive Director Troy Williams at right, Senator Stephen Urquhart, R-StGeorge, speaks to his bill HB107 - Hate Crimes - in the Utah Senate, Wednesday, March 2, 2016. 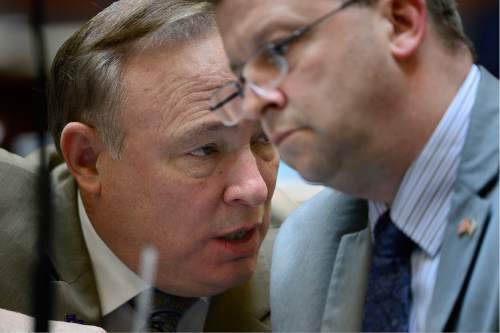 Scott Sommerdorf | The Salt Lake Tribune Senator Jim Dabakis, D-Salt Lake, left, speaks with Senator Todd Weiler, R-Woods Cross, before the debate on HB107 in the Utah Senate, Wednesday, March 2, 2016. Scott Sommerdorf | The Salt Lake Tribune Senator Jim Dabakis, D-Salt Lake, speaks about HB107 - Hate Crimes - in the Utah Senate, Wednesday, March 2, 2016. 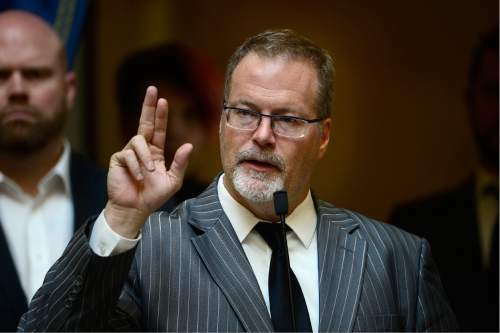 Scott Sommerdorf | The Salt Lake Tribune Senator Stephen Urquhart, R-StGeorge, speaks to his bill HB107 - Hate Crimes - in the Utah Senate, Wednesday, March 2, 2016. 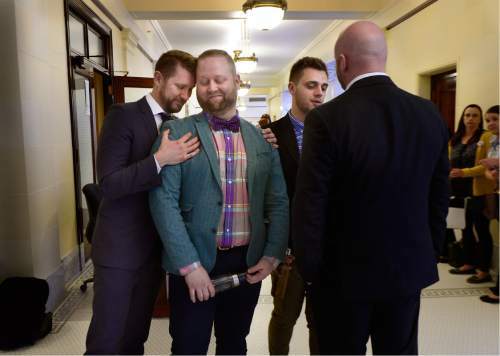 Scott Sommerdorf | The Salt Lake Tribune Troy Williams, Executive Director of Equality Utah, left, commiserates with assault victim Taylor Lamont after the vote on HB107 in the Utah Senate, Wednesday, March 2, 2016. Senator Stephen Urquhart's Hate Crimes bill failed on a 17-11 vote. 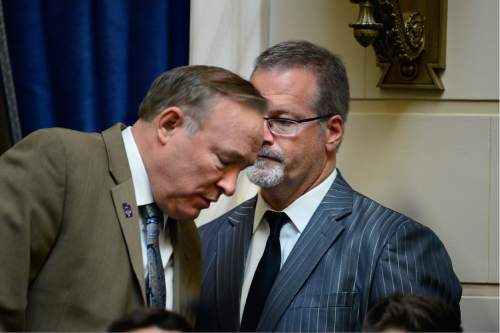 Scott Sommerdorf | The Salt Lake Tribune Senator Jim Dabakis, D-Salt Lake, left, confers with Senator Stephen Urquhart, R-StGeorge, prior to HB107 - Hate Crimes - being called up in the Utah Senate, Wednesday, March 2, 2016. Scott Sommerdorf | The Salt Lake Tribune Senator Jim Dabakis, D-Salt Lake, speaks about HB107 - Hate Crimes - in the Utah Senate, Wednesday, March 2, 2016. 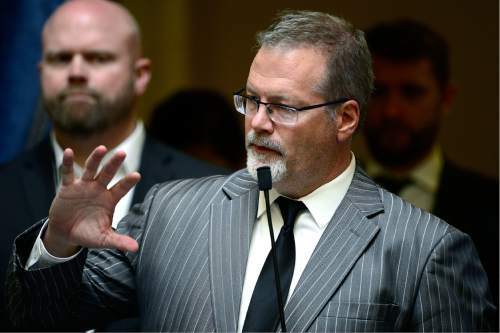 Scott Sommerdorf | The Salt Lake Tribune Senator Stephen Urquhart, R-StGeorge, speaks to his bill HB107 - Hate Crimes - in the Utah Senate, Wednesday, March 2, 2016. Scott Sommerdorf | The Salt Lake Tribune Senator Todd Weiler, R-Woods Cross, speaks against HB107 in the Utah Senate, Wednesday, March 2, 2016. The bill failed on an 11-17 vote. 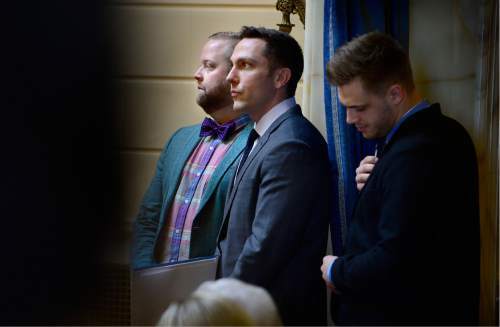 Scott Sommerdorf | The Salt Lake Tribune Assault victims Taylor Lamont, Rusty Andrade and Maxwell Christen, right, listen to debate on HB107 - Hate Crimes - in the Utah Senate, Wednesday, March 2, 2016. 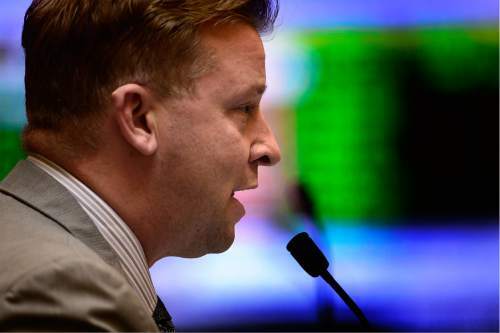 Scott Sommerdorf | The Salt Lake Tribune Senator Stephen Urquhart, R-StGeorge, speaks to his bill HB107 - Hate Crimes - in the Utah Senate, Wednesday, March 2, 2016. 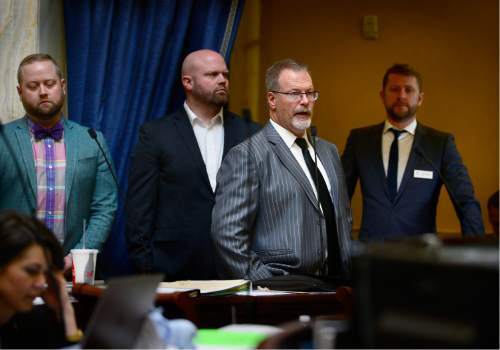 Scott Sommerdorf | The Salt Lake Tribune Assault victims Taylor Lamont, Rusty Andrade and Maxwell Christen, right, listen to debate on HB107 - Hate Crimes - in the Utah Senate, Wednesday, March 2, 2016. Rusty Andrade was prepared to lose. 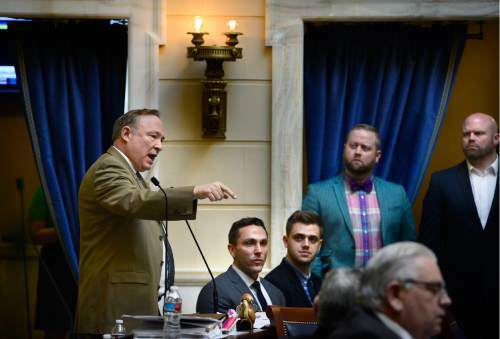 But it still felt like a punch to the gut Wednesday as he watched, from a seat on the Senate floor, lawmakers vote to kill a proposal to bolster Utah&apos;s hate-crime laws. "It totally feels like a revictimization," said Andrade, 35, whose 2014 beating by two men shouting gay slurs helped inspire Sen. Steve Urquhart&apos;s hate-crime bill. "It just re-emphasizes that they don&apos;t see us worthy of protection." SB107 failed on a 17-11 vote. It would have allowed prosecutors to bump up, by one step, charges for bias crimes and offer protections for all Utahns based on the protected classifications of "ancestry, disability, ethnicity, gender, gender identity, national origin, race, religion or sexual orientation." "I lost this battle and I&apos;m bummed, but we&apos;re going to win this war on hate crimes. There&apos;s no doubt. Look at where we are as a state and society compared to 10, 20, 30 years ago," Urquhart, a St. George Republican, said. When it comes to full inclusion of LGBT people in society, "we know how that&apos;s going to turn out. It&apos;s just a question of when we get there." 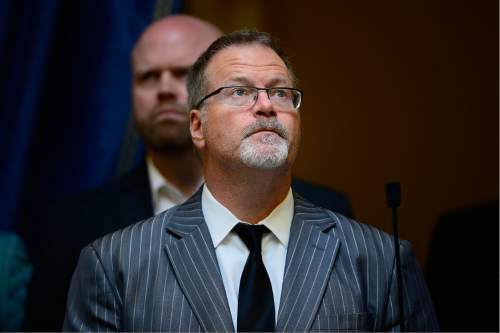 Sen. Curt Bramble, R-Provo, supported the bill, but he changed his vote to "no" as a procedural move to give Urquhart a chance to revive the legislation if he can swing enough votes. It takes 15 votes to win Senate passage. But Urquhart said senators have made up their minds, and he can see no way to sway the votes. It&apos;s clear, he said, that the opposition from Utah&apos;s predominant religion, The Church of Jesus Christ of Latter-day Saints, ultimately killed his bill, changing at least three votes that would have meant its passage and shutting down the dialogue he would have needed to win back support. "I felt that we were going to pass hate crimes through the process," he said, "and after their statement, there was really no way." Urquhart met Wednesday morning with officials from the LDS Church before the vote on the bill, a meeting in which he said he expressed his frustration that the faith opposed the measure without discussing it with him first and that the church shouldn&apos;t be the "arbiter" of LGBT issues. In a statement last month, the LDS Church expressed a desire to maintain a balance struck last year when the Legislature  with the faith&apos;s support  passed a landmark LGBT anti-discrimination law. That meant not moving forward on hate crimes or legislation being proposed by Rep. LaVar Christensen, R-Draper, that declared Utah&apos;s right to disregard the U.S. Supreme Court&apos;s gay-marriage rulings and regulating which bathrooms transgender Utahns could use. Urquhart said it was "inappropriate" to equate his hate-crime measure to an attempt to regulate bathroom use. "My bill is legitimate. Those are creepy and illegitimate. There is no moral equivalency." 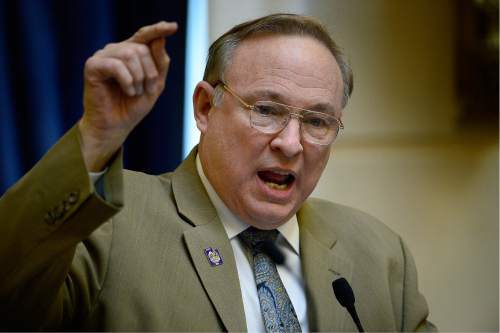 Sen. Jim Dabakis, D-Salt Lake City, the only openly gay member of the Utah Legislature, expressed frustration with resistance to SB107 and arguments that supported the LDS Church&apos;s not-this-year position. "The biggest argument I have heard is that we had our quota last year of gay bills and therefore maybe if we wait a few more years, it will come time," said Dabakis. "I find that a bit outrageous." No other references to the church&apos;s position or actions were mentioned Wednesday. Instead, SB107&apos;s critics said they opposed the bill&apos;s inclusion of protected classes  a historical argument against similar hate-crime proposals dating back to the 1990s  and fears that the legislation would criminalize thoughts. Urquhart dismissed both arguments as false. Sen. Howard Stephenson, R-Draper, came to his aid, reminding the body that a companion resolution to the bill would set evidence standards for prosecutors to protect free speech and association. Activists expressed their disappointment over Wednesday&apos;s vote, but they said they would spend the year ahead working to educate lawmakers and the public about the need for the bill&apos;s protections and try again next year. "Truthfully, we are just getting warmed up," said Troy Williams, director of Equality Utah, which built a coalition of more than 30 organizations to support the bill. "Utah was founded by a people fleeing vicious hate crimes. Passing this legislation is ultimately the right thing to do." Andrade was less forgiving. He accused lawmakers of playing politics and using false arguments about classes and special rights to avoid taking action that would protect every person in Utah  including white Mormon men  not just members of minority groups or the gay and transgender community. "This was just a total avoidance of responsibility," he said. "I think it was frankly shameful." Andrade, whose friends Maxwell Christen and Taylor Lamont were attacked alongside him outside their Salt Lake City condominiums in December 2014, said Utah is operating as a theocracy and not a democracy. "The fact that the LDS leaders simply whisper into the ears of their members and shape state legislation is abhorrent," he said. "Today the people were silenced for a political agenda. It&apos;s time for citizens to be treated with dignity and equality, regardless of their classification."